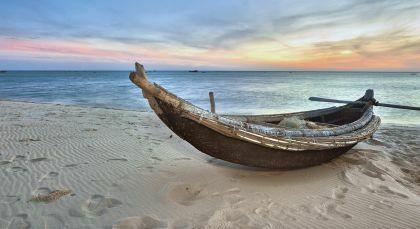 This is the ultimate white glove tour of Vietnam, with luxurious stays in a state of the art cruise ship and hotels, exceptional service, premium vehicles at your disposal and the Enchanting Travels VIP experience everywhere your go. Indulge yourself! 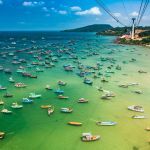 From the charming to Hanoi to a relaxing cruise in Halong Bay, and the former imperial city of Hue to historic Hoi An and bustling Ho Chi Minh City, this private luxury Vietnam tour offers unforgettable impressions! Soak in some old-world charm! 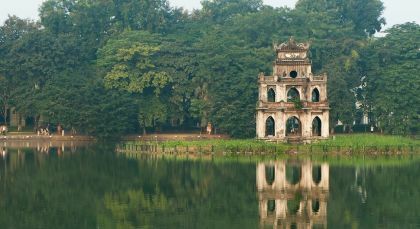 Tree-lined pathways, glittering lakes and charming colonial buildings make Hanoi a visual treat! Your half day tour of this historic city starts at the impressive Ho Chi Minh Mausoleum, where Ho’s preserved body rests, except on Mondays and Fridays, when visitors are not allowed. At Ho’s beautiful house behind the mausoleum, you can view his belongings which are on display. Follow this up with a bicycle ride through the bustling Old Quarter, where almost everything in the world is on sale! The fascinating maze of back alleys offers great insight into Vietnamese culture. 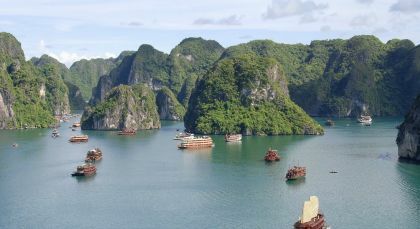 Delve into Hanoi’s colonial buildings, tree-lined boulevards and scenic lakes. Start at the historic mausoleum and former house of Vietnamese Communist revolutionary leader Ho Chi Minh. Visit the beautifully designed lotus-shaped Buddhist temple of One Pillar Pagoda. If you wish to gain an overview of Hanoian culture and ancient architecture then you will be in for a treat at the Temple of Literature, whilst the Museum of Ethnology offers fascinating insights into Vietnam’s 54 ethnic minority groups. You can observe the hustle and bustle of Hanoi’s Old Quarter with a thrilling one hour cyclo ride, where many local people go about their daily lives. To complete this culturally rich day, enjoy a performance at the mystical Water Puppet Theater, which brings to life a traditional art form describing daily life and the legends of Vietnam’s history. The imperial city of Hue was once home to Nguyen Lords, and its splendid tombs, ancient pagodas and ruins still bear testimony to past glories. A city tour starts with a 10 minute cyclo ride to the Imperial Citadel – a UNESCO World Heritage Site, where architectural marvels and beautiful gardens welcome you and your guide tells you about the former royal court. Despite heavy bombing, several sections of the Citadel remain intact or have been carefully restored. A short drive from here takes you to the Thien Mu Pagoda – a famed seven-storeyed religious monument which stands on the riverbank. Discover Hué’s imperial past of Nguyễn lords on a thrilling twenty to thirty minute cyclo ride that takes you to the tombs, pagodas and UNESCO World Heritage Site of Imperial City. Enter the main gate and witness a palatial world of magnificent architecture, landscaped gardens and ancient, intriguing stories! On the banks of Perfume River, visit the compelling seven storey tower of Thien Mu Pagoda, the city’s best-preserved religious monument. Drive for thirty minutes to the elaborate Khai Dinh Royal Tomb, which showcases an outstanding fusion of eastern and western architecture. Visit the serene Tu Duc Royal Tomb, which was built on feng shui principles and harmonizes with its natural environs. You can also stop off at an incense stick maker’s house! 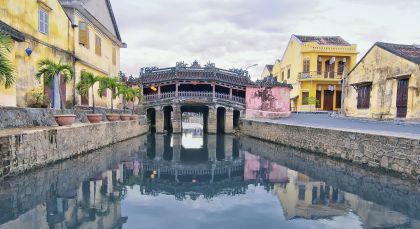 Explore the commercial capital of Vietnam! 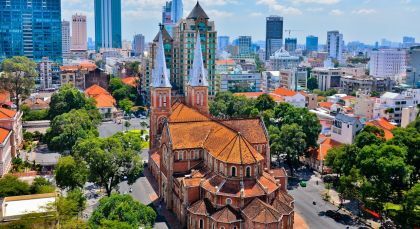 Saigon or Ho Chi Minh City has more than eight million people and four million motorbikes and yet retains its old world charm. A half day tour takes you to the Notre Dame Cathedral – a replica of the Parisian marvel across the square from which lies the Central Post Office – designed by French architect Gustave Eiffel. The former Presidential Palace and the War Remnants Museum tell the story of Saigon’s turbulent past. Enjoy a break with your guide at The House of Saigon Coffee Shop, and learn interesting tidbits about life in Saigon. A wonderful 22 day trip in Vietnam. Enchanting Travels worked with me to include what I wanted. The itinerary was very well planned, diverse and exciting. The hotels were fantastic. I would recommend them to everyone and will use them again.